Thank you so much for taking an interest in Whittier Marine Charters! We’re always ready to chat about reservations, activities and available dates. Please direct your queries to matt@fishwhittier.com. Our staff will respond ASAP. Our office is located approximately one mile from the Tunnel’s exit. We can be found at Lot 1 Harbor Loop Drive, right on the waterfront. After crossing the bridge over Whittier Creek, turn left just past the four way intersection. 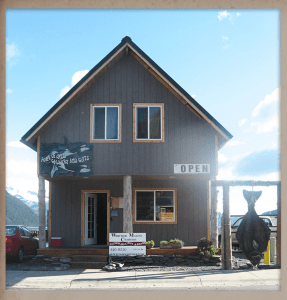 You’ll find us directly across from Shoreside Petroleum and next to the beautiful Inn at Whittier. With our large red and white signs and a ten-foot, carved wooden halibut hanging outside our building…we’re fairly hard to miss! Join Whittier Marine Charters on Facebook! You’ll find more photos, fishing/sightseeing reports, and some pretty lively discussion! View special promotions and maybe receive a discount or two!